AMANDA JANE has a hard vinyl body, short rooted hair and painted-on eyes, and is the youngest-looking of the vintage dolls we offer. She was 'born' in the U.K in 1952, but suffered a setback in 1965 when all the company's patterns and records were destroyed in a fire at the factory. 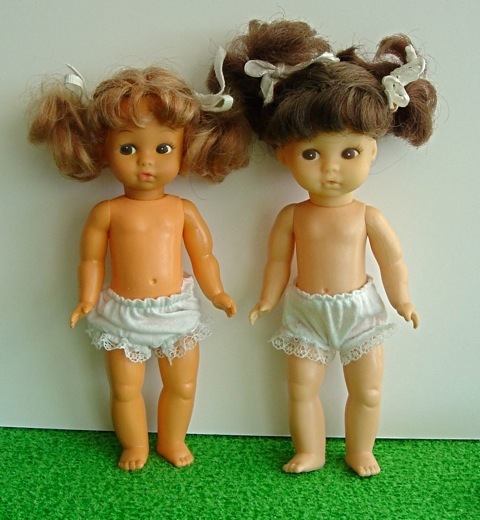 Nevertheless, the very popular 7in/17.8cm toddler doll, Amanda Jane, emerged from the ashes to become a beloved favourite. 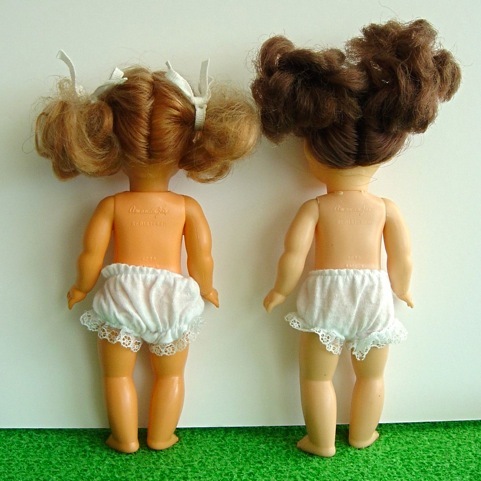 We have two of these dolls, one with brunette hair, one with dark blonde, both with pigtails/bunches. Please note the slight colour differences on the body of the blonde doll - something that sometimes happens to hard plastic over time.